Kubica said he's happy with his performance, which speaks volumes about how things went. Years after his life-changing 2011 rally crash, which ended Robert Kubica's Formula 1 career, the Polishman's climb back toward the pinnacle of motorsport started back in June, with a surprise appearance driving a V-8 era car for Renault, which qualified him in Renault's eyes for a test in this year's R.S.17. Though things didn't work out, and Carlos Sainz Jr. landed in the seat Robert coveted, Williams expressed interest, through him behind the wheel of their 2014 car, the FW36, on two separate occasions, proving him worthy of a drive in the team's 2017 car, the FW40, at this year's Pirelli tire test. 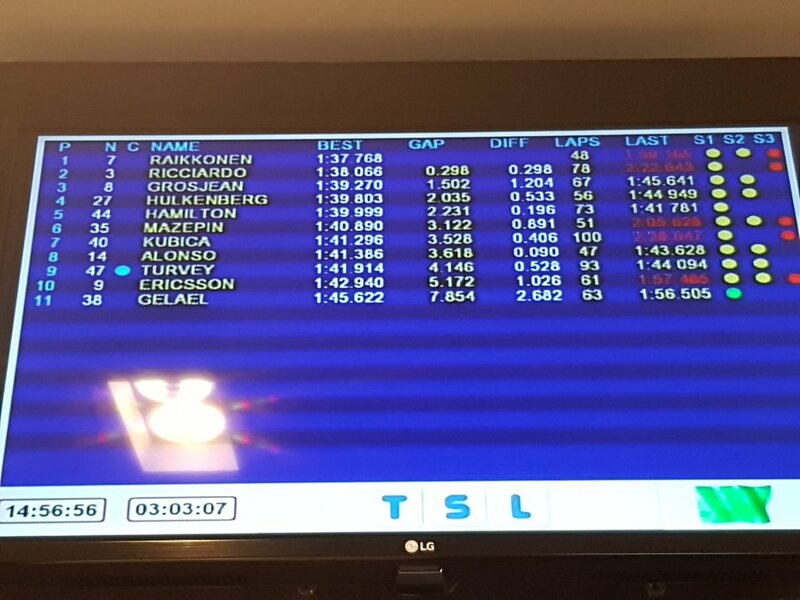 Tuesday, Kubica took the helm of the FW40 for the morning session of the first day of testing, clocking 100 laps, and placing ninth fastest among the eleven drivers on track. His best time, 1:41.296, is more than a second faster than the times achieved by Felipe Massa and Lance Stroll during Sunday's Abu Dhabi Grand Prix, according to lap charts published by F1 Fanatic. A promising time, made exciting by confirmation from Pirelli that Kubica was the only driver not to set his fastest time on the experimental "hypersoft" tire compound being developed for use next year. It has not been confirmed which tire compound Kubica used to set his best time, though the photo linked above suggests it was either soft or super soft—likely the latter. Footage posted by the sport's official Instagram account (embedded below) shows only the yellow-banded soft tires in use. Robert almost certainly has a quicker lap up his sleeve, and Autosport reports that Wednesday's session will probe just how much pace he is capable of wringing out of the car. It is then that Kubica may opt to mount "hypersoft" tires and show what he's made of. Kubica also revealed (just as predicted) that his physical fitness is of zero concern, swatting down rumors that he was driving with only his left hand. "There is someone saying I'm driving one-handed. I'm not driving one-handed," said Kubica to Autosport, "I think it's impossible to drive a Formula 1 car with one hand." He also discloses that he believes he is more fit than when he last raced in F1, back in 2010, a belief supported by his cockpit extraction test, which he passed faster than any current F1 driver. Kubica disclosed via Planet F1 that although he would be let down if this test took him nowhere, he is proud of what he has achieved thus far, and is pleased with his own performance. "First of all, I have to be sure that I am able to do it and for sure every day—and a day like today—is giving me quite a lot of confidence that things can work out pretty well [sic]," said Kubica, according to Planet F1, "For my standards, pretty well means it has to be a high level." "In the end, what the future will bring I don't know, but definitively if you look at the overall picture, where I was 12 months ago and where I am now, it has been a good 12 months. For sure today was the kind of day that if nothing more happens, there will be some disappointment because I feel very confident and very comfortable, but also if you think where I was, I can only be happy and a bit proud of what I achieved in the last ten months." Williams' technical director Paddy Lowe felt the same way about Robert's physical condition, stating to Eleven Sports, "there is no doubt as to the physical form of Robert. He did a really good job today." There was one tiny detail of Tuesday's test, overlooked by most, however. Astute fans called to attention the color of the light on the back of Kubica's car, lit red for this test, pointing out that drivers who don't possess an FIA Super License—required for those who wish to compete in F1—are equipped with green taillights, such as the one Kubica ran with during his Hungary test. Photos of the red light on Kubica's car were shared online alongside this observation. As of late October, word was that Kubica did not possess an FIA Super License, but the change to the light color implies he has attained one, and that someone has forked over the cash to invest in a Formula 1 future for Robert. In contrast, here is a video of Oliver Turvey's McLaren-Honda MCL32 from the same test, which blinks green rather than the red shown on Kubica's car. The Drive asked Williams for a statement on the light color-based findings, and a team spokesperson dismissed the interpretation that Kubica possesses an FIA Super License as "not correct." The team has yet to formally decide who will occupy their open 2018 seat, but winds are blowing Robert's way. Keep yourself occupied until the team's announcement with this video of Kubica on track. We dare say it looks like he hasn't lost any talent over the years. Williams says it is still evaluating Kubica's fitness, but we don't buy it. The four-time world champ claims that Abu Dhabi showed the gap between Ferrari and Mercedes. Did Sebastian Vettel Blow His Championship Chances in 2017? While reliability issues hamstrung Vettel, the role the driver played is undeniable. The Finn converted pole to a win to end the season.